MANITOWOC, WI, December 13, 2016 – Dowco is pleased to announce it has received an Accessory Performance Award for Operations from American Honda Motor Company for the category of Honda Power Sports Covers and Luggage. The award was presented to Dowco “In recognition of your outstanding dedication to accessories” last month at the 2016 American Honda Accessory Supplier Conference in Las Vegas, NV. 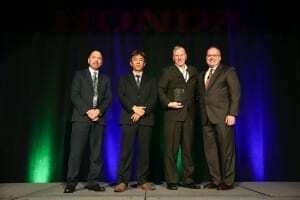 The award was presented for Dowco’s exceptional commitment and dedication to American Honda Accessory Operations. Dowco manufactures motorcycle covers, leather saddlebags and other luggage items for Honda. Dowco is based in Manitowoc, WI and has a total of seven manufacturing facilities in the US. It is a leading manufacturer of textile, leather and plastic products for the leading powersports, construction, agriculture and marine OEMs. For more information, please visit redlineplastics.com.